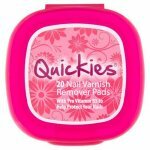 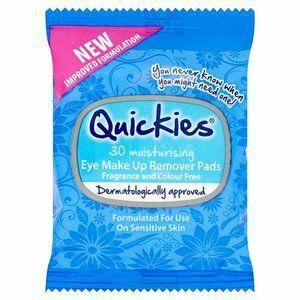 Quickies Eye Make Up Remover Pads are enriched with flower extract and moisturising oil to help soothe and cleanse the delicate eye area. 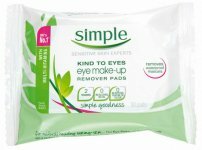 They are fragrance and colour free and remove long lasting and waterproof make up. 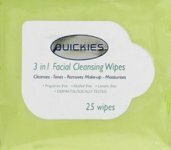 Peel back the adhesive label, remove cleansing wipe, ensure the pack is properly re-sealed to prevent wipes drying out. 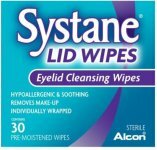 Aqua, Glycereth-7, Caprylate/Caprate, Polyquaternium-7, Babassu Oil Glycereth-8-Esters, Rosa Centifolia Extract, Glycerin, Sodium Citrate, Citric Acid, Tetrasodium Glutamate Diacetate, Sodium Hydroxide, Phenoxyethanol, Benzoic Acid, Dehydroacetic Acid, Sodium Benzoate, Potassium Sorbate.